In North America, however, the Heller myotomy approach of choice was via a left thoracotomy after being described in this way by Ellis et al in 1958. Traditionally, no associated antireflux procedure was performed. The transabdominal approach is now the most common way of performing an open Heller myotomy. Pneumatic dilation, with its 2% risk of perforation, was historically the first choice for achalasia treatment, with surgery reserved for failures. Calcium-channel blockers and long-acting nitrates have been attempted as medical therapy to reduce lower esophageal sphincter (LES) tone but are relatively short-acting, do not improve LES relaxation in response to swallowing, have significant side effects (eg, headache), and have little overall success. Botulinum toxin injections can be temporarily successful, primarily in older patients. The pathophysiology is likely secondary to abnormal innervations (inhibitory nonadrenergic, noncholinergic ganglion cell degeneration, and neural fibrosis) of the myenteric plexus. Concurrent significant decreases in synthesis of nitric oxide and vasoactive intestinal peptide (mediators of relaxation) have been noted. Autoimmune conditions, viral infections, and protozoan infections (eg, Chagas disease from Trypanosoma cruzi in South America) have also been attributed as causes of achalasia. Presenting symptoms have an insidious onset (usually over a duration of at least 2 years) and include progressive dysphagia, regurgitation, chest pain or heart burn, aspiration, and weight loss. Diagnosis is based on failure of the LES to completely relax with swallowing, confirmed by means of esophageal manometry (the criterion standard), contrast esophagography, or esophagoscopy. The classic description radiologically is a "bird's beak" narrowing of the esophagus observed during contrast esophagography. After the need for surgery is determined, indications for open versus laparoscopic approaches are considered (see Technical Considerations). Heller myotomy is contraindicated in patients with prohibitive surgical risk factors and in those who refuse surgery. Previous pneumatic dilation should not be considered a contraindication to performing Heller myotomy. The thoracic approach is recommended when a patient has undergone multiple prior abdominal operations, has had a failed transabdominal myotomy, or has diffuse esophageal dysmotility. Botulinum toxin injection before the surgical procedure creates fibrosis and increases risk of mucosal perforation during dissection. Symptom improvement is reported in an average of 83% of patients undergoing transabdominal open Heller myotomy. Objectively, a 74% decrease in LES pressure was seen. Other sources reported that permanent relief of dysphagia could be expected in 85-100% of patients. One literature review of transthoracic and transabdominal open procedures found that the length of the gastric myotomy did not influence postoperative results. However, performing fundoplication improved both symptomatology and pH monitoring results. Abir F, Modlin I, Kidd M, Bell R. Surgical treatment of achalasia: current status and controversies. Dig Surg. 2004. 21 (3):165-76. [Medline]. Allaix ME, Patti MG. Heller myotomy for achalasia. From the open to the laparoscopic approach. World J Surg. 2015 Jul. 39 (7):1603-7. [Medline]. Moonen A, Boeckxstaens G. Current diagnosis and management of achalasia. J Clin Gastroenterol. 2014 Jul. 48 (6):484-90. [Medline]. Patti MG, Fisichella PM. Controversies in management of achalasia. J Gastrointest Surg. 2014 Sep. 18 (9):1705-9. [Medline]. Katilius M, Velanovich V. Heller myotomy for achalasia: quality of life comparison of laparoscopic and open approaches. JSLS. 2001 Jul-Sep. 5 (3):227-31. [Medline]. Morino M, Famiglietti F, Giaccone C, Rebecchi F. Robot-assisted Heller myotomy for achalasia: technique and results. Ann Ital Chir. 2013 Sep-Oct. 84 (5):520-3. [Medline]. Patel K, Abbassi-Ghadi N, Markar S, Kumar S, Jethwa P, Zaninotto G. Peroral endoscopic myotomy for the treatment of esophageal achalasia: systematic review and pooled analysis. Dis Esophagus. 2016 Oct. 29 (7):807-819. [Medline]. Misra L, Fukami N, Nikolic K, Trentman TL. Peroral endoscopic myotomy: procedural complications and pain management for the perioperative clinician. Med Devices (Auckl). 2017 Feb 23. 10:53-59. [Medline]. [Full Text]. Vaezi MF, Richter JE. Current therapies for achalasia: comparison and efficacy. J Clin Gastroenterol. 1998 Jul. 27 (1):21-35. [Medline]. Fischer JE. Mastery of Surgery. 5th ed. Philadelphia: Lippincott Williams & Wilkins; 2007. Shiino Y, Filipi CJ, Awad ZT, Tomonaga T, Marsh RE. Surgery for achalasia: 1998. J Gastrointest Surg. 1999 Sep-Oct. 3 (5):447-55. [Medline]. Jobe BA, Hunter JG, Peters JH. Esophagus and diaphragmatic hernia. Brunicardi FC, Andersen DK, Billiar TR, et al, eds. Schwartz’s Principles of Surgery. 9th ed. New York: McGraw-Hill; 2010. Andreollo NA, Earlam RJ. 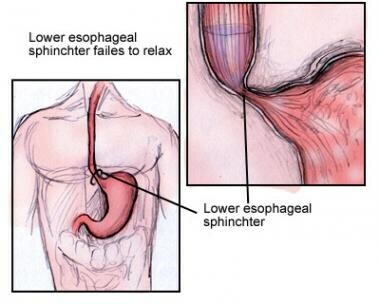 Heller's myotomy for achalasia: is an added anti-reflux procedure necessary?. Br J Surg. 1987 Sep. 74 (9):765-9. [Medline]. [Full Text]. Gouda BP, Nelson T, Bhoyrul S. Revisional surgery after heller myotomy for treatment of achalasia: a comparative analysis focusing on operative approach. Indian J Surg. 2012 Aug. 74 (4):309-13. [Medline]. [Full Text]. Veenstra BR, Goldberg RF, Bowers SP, Thomas M, Hinder RA, Smith CD. Revisional surgery after failed esophagogastric myotomy for achalasia: successful esophageal preservation. Surg Endosc. 2016 May. 30 (5):1754-61. [Medline].